Last night, I played an awesome game against my buddy Armando. Kreoss2 versus his mercenaries…. didn’t really matter what lists we were playing. It came down to the last few activations. The slice of it — I popped Kreoss2’s feat (auto-hit in melee, extra melee attack for friendly faction models in ctrl area, etc). I charged a knight exemplar at his caster (base defense doesn’t-matter, armor 18). I roll 4D6 (weapon master) at POW 14… it’s dice minus 4. The percentage chance for this happening are 0.06%….or really small. Then after a few seconds, recovering myself, I rolled my free melee attack with 3D6. This did 11 damage. Slightly above average. On the way home, I’m thinking to myself if this kind of crazy thing happens, where the most improbable happens. Four 1’s in a single roll. I think people can go their entire lives, play a ton of tabletop miniature games with 4D6’s and still never get four 1’s to appear. I’m not even sure 40k players, who roll buckets-of-dice, see this happen often. Then, I remembered my game against Shane (his blog here) during the Journeyman League at Gamer’s Gambit. Yes, the odds of what happened with his dice were beyond my comprehension. I don’t know the physics of how this happened, but there’s no math in my book that can calculate the chances of this scenario. 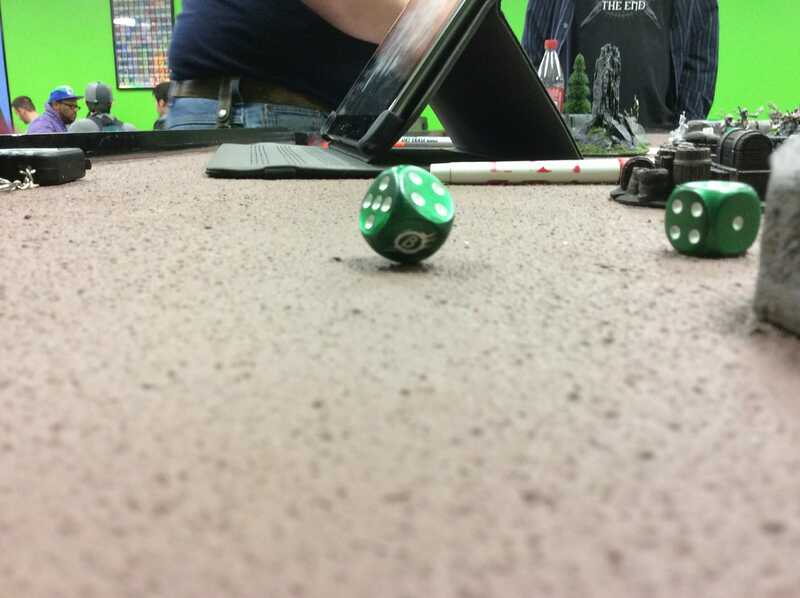 Shane literally threw the dice, which bounced on the table a few times, and one of them landed on it’s corner (???!!!). We couldn’t even decide whether they were cocked and whether he should re-roll the dice or not. In the end, we concluded that his winter guard deserved a pass. They survived the command check. Shane and I didn’t want to get struck by lightening on the way home. Anyway, I guess losing my game against Armando by rolling four 1’s wasn’t so improbable after all, right? I should buy a lottery ticket. Next Post Miniature Tabletop Going Mainstream?